Is My Kid Smoking Pot? Introduction: Is My Kid Smoking Pot? Chances are, if you've found this website, you're already asking yourself, Is my kid smoking pot? Rummaging through their personal belongings without anything more than parent's intuition will immediately alienate you from your teenager. However, with a better understanding of the signs, paraphernalia, and activities of a typical pot-smoking teenager, it may be easier to relate to your teenager about their use of marijuana and approach him or her for a meaningful discussion. Our website incorporates the experiences of former teenage marijuana users in an attempt to provide parents with enough current information to be credible. This website is dedicated to providing a realistic, up-to-date look at the signs, symptoms, and possible proof that may answer the question once and for all, is my kid smoking pot? There are many signs that can inform parents as to whether or not their kids are smoking pot. Everything from the smell, red or swollen eyes, or uncharacteristic behavior can clue you in that illegal substance use might be an issue you need to address. In the next section we will attempt to describe some physical signs of marijuana use in your kid. Marijuana has a very distinct smell similar to a skunk's spray. It may also be compared to the smell of burnt lawn clippings. An easy way to simulate the smell, so you know what you're looking for, is to burn a dried leaf from a maple tree. Although not exactly the same, the smell is very similar to that of burning marijuana. Be suspicious of a kid that’s constantly spraying air freshener into their room or car or picks up a new incense or candle burning habit. This might not apply to every kid, but in some cases they could potentially be hiding something. Smoke shops sell highly potent air sanitizing sprays that claim to eliminate smoke in the air. They usually come in smaller, more compact canisters, and are sold at a higher rate than the average air freshener. If your kid has begun to come home wearing heavy cologne, perfume, or body spray this could also be an indicator, especially if they typically wear a reasonable amount or none at all. Some kids will also try to cover the smell by burning strongly scented incense or candles. They may even try to pass off the smell of pot smoke as incense or candles. In some cases, a device called a “toke blower” can be crafted to try to mask the smell. Marijuana users simply blow smoke through it in an attempt to disguise the scent of marijuana smoke. Smokers will also typically open a window to air out a smoky area. If the suspected pot smoker has an open window during winter or when the AC is on, chances are they are attempting to air out the area after recent use. Clothing will also hold the scent of marijuana smoke. This smell can be described as musty, musky, of earthy. A marijuana smoker is aware that their clothing will hold the smell of smoke and therefore may use excessive body spray or cologne in an attempt to cover it up. A pot smoker’s breathe will also hold the smell of marijuana for some time. Uncharacteristic or excessive teeth brushing, gum chewing, breath mint popping, etc. can also be a good sign that the suspected teenager is trying to cover up the smell of smoke on their breath. 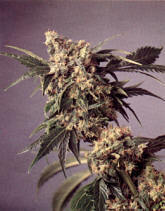 Marijuana smoke also adheres itself to the smoker's hands, or most specifically, the fingers. The thumb and index finger are usually used in smoking a joint; therefore these two fingers will retain the smell long after the joint has been smoked. Hand washing can usually eliminate the smell. However, unless the pot smoker focuses on the fingers, the smell will remain long after typical hand washing. A person under the influence of marijuana will most likely have red, swollen, bloodshot, irritated, or glassy eyes. The red eyes, also know to pot smokers as "chinese eyed" or "chink eyed", can temporarily be covered up with Visine or similar medicated eye drops (also known as "white eye"). Although the eye drops may relieve the smoker of irritated red eyes, it will not be able to remove the glassy eyed, glazed over look in a teenagers eyes due to recent use. Some smokers prefer to wear sunglasses to hide their eyes, so wearing sunglasses indoors and/or at unusual times should be viewed as a red flag. When smoked, marijuana leaves a tar-like residue behind commonly known as "resin". In some cases, the resin may leave fingers and or lips and teeth with a yellowish, brown tar-like stain. If resin comes in contact with clothing, it will not wash out. Attempting to wipe off resin stained clothing can result in a smear that’s easily detected. Attempting to wash clothing may also result in the transfer of resin to other clothing in your machine. The presence of resin is another sign that’s difficult to conceal. Money or the lack of money is a common issue affecting your average teenager. However, if your kid is asking for more money than usual or has been spending quite a bit of their own money with nothing really to show for it, there may be a marijuana problem at the heart of their recent spending spree. The cost of marijuana is relatively inexpensive to a working adult. However, to a kid attending middle school or high school, the cost of getting high is not cheap. The following is a breakdown of the quantities and estimated costs of purchasing marijuana. Obviously higher quantities can be purchased for much higher costs. Chances are however, that unless your child had access to large amounts of money, the list above should cover the bulk of their purchases. The hungry feeling that usually accompanies getting high is referred to as “having the munchies”. If your kid starts eating unusually large amounts of food at odd times you may want to check into it. Occasionally pot smokers will get strange cravings for food they rarely eat when not under the influence. Dry mouth is also common after smoking pot. A person who has just smoked will typically have a beverage nearby. A kid who has started smoking pot needs a place to get it from. You may notice that your child is taking more phone calls, many in private. New friends may or may not appear. Friends and acquaintances may stop by for short periods of time and leave (just enough time for a drug deal). Your child may start taking more rides with friends, giving you brief, false explanations as to where they have been. Their time away from home becomes more and more unaccounted for. Also be wary if after returning home, your child heads straight to their room without stopping to speak to anyone, and stays there (hiding) for a considerable amount of time. Many of the signs listed above can certainly apply to any teenager. The teenage years with their raging hormones and bodily changes can certainly account for some of the suggested red flags listed above. As a parent, your best defense is to stay involved in your child’s life. Be honest with them. Know who their friends are. Know where they are when they go at night. Above all, be observant at all times and look for many of the signs that your kid could be smoking pot. If your kid exhibits several of the signs listed above, it may be time for an impromptu search or at a bare minimum a frank discussion.